Five vestment colors are customarily permitted by the Christian Church in regard to Sacred Vesture and Altar Paraments. These colors are White, Red, Green, Purple/Violet and Black. 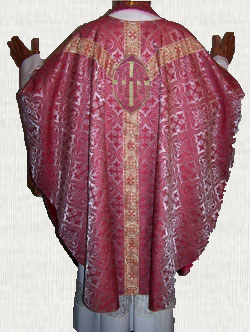 Rose colored Vestments/ Paraments are permitted on the third Sunday of Advent and the fourth Sunday of Lent. Blue (Pale or Marian blue) has traditionally been used as one of the vestment colors in the countries of Spain, Portugal, Mexico and South America. In the Philippines it is used for all Feasts of the Blessed Virgin Mary, a practice followed in some other places without official authorization or tradition. There has also been, since the early 1980’s the unauthorized uses of Blue in place of Purple/Violet for the season of Advent. This is an innovation of a Commercial nature and is seriously to be avoided. The medieval use of Sarum–Salisbury allowed for other various vestment colors including Yellow. This use however was of a local use and is therefore considered improper for those outside of the Salisbury diocese. Vestments of Cloth of Gold or Gold silk are allowed; in most cases this rich fabric is used as a substitute for Major feasts such as The Nativity of Our Lord; Feast of the Resurrection, Corpus Christi, etc. The use of Cloth of Silver is also permitted but only as a substitute for White. Neither of these, Cloth – Silk Gold and Cloth of Silver may never be used however during periods of the Liturgical year when Purple/Violet is prescribed. As might be expected, each of the above vestment colors has its own meaning. The Holy Eucharistic – Mass is offered for many purposes and in honor of many classes of Saints; these various purposes are all designed and symbolized by the color of the Vestments – Paraments which the Church prescribes for each Mass. When the Church wishes to denote Purity, Innocence or Glory, she uses White; that is, on the Feasts of Our Lord and of the Blessed Virgin Mary, the festivals of the Holy Angels and of those Saints who were not Martyrs. Red is the color of fire and of blood; it is used in Masses of the Holy Spirit, such as on Pentecost, to remind us of the tongues of fire and on the Feasts of those Saints who shed their blood for the Faith. The color Green is used from the Octave of the Epiphany to Septuagesima, and from the Octave of Pentecost to the 1st Sunday of Advent, except on Ember Days and Vigils during that time, and on Sundays occurring within an Octave. The use of Purple or Violet is used from the 1st Sunday of Advent and from Septuagesima to Easter, on Vigils that are Fast days, and on Ember days, except the Vigil of Pentecost and the Ember days during the Octave of Pentecost. Purple/Violet is also used for Mass on Rogation days, for Votive Masses of the Passion and of Penitential character, at the blessing of candles and of holy water. The Stole used in the administration of Penance and of Unction and in the first part of the Baptismal rite is to be Purple/Violet. Black Vestments have traditionally been worn at all Requiem Masses including All Souls' Day; at the Good Friday Liturgy up to but not including the Communion service. Since the early 1970’s the use of White has been allowed for Funerals. Traditionally White was also the use for Funerals of children under the age of 6-8 years. The rules for liturgical colors changed slightly when Pope John XXIII revised the Roman Missal in 1962. Learn these differences.